2 Combine Hellmann's® or Best Foods® Real Mayonnaise with pepper sauce and cheese in medium bowl. 3 Arrange chicken in shallow baking pan. Evenly top with half of mayonnaise mixture, then sprinkle with bread crumbs. 4 Bake 25 minutes or until chicken is thoroughly cooked. Spread toasted buns with remaining mayonnaise mixture. 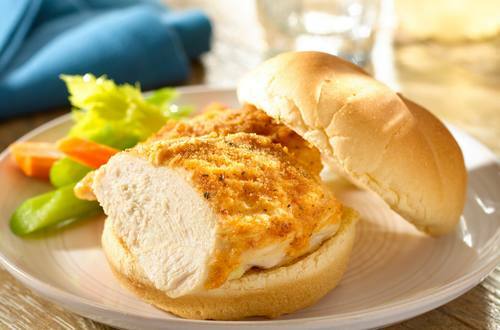 Serve chicken on buns. *Such as FRANK'S® REDHOT® Original Cayenne Pepper Sauce.